A few months after Paul and I got married we were at Costco and spotted a neat display. 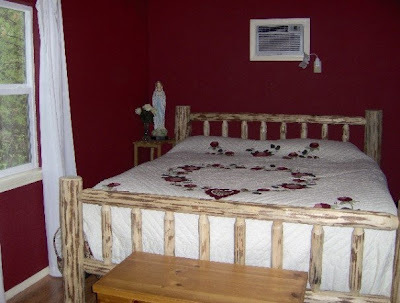 A man was selling Amish-made log furniture and the king sized bed was absolutely beautiful. At the time we were living in the trailer (the thirty foot long travel trailer... if you're curious it's the first picture in this post...) and were sleeping on an air mattress that seemed to be half deflated by morning. The bed looked pretty wonderful. We bought it later that week with plans to sleep on it someday. Fast forward to the move to Florida. The bed is pretty gigantic. After we built the cabin it took up most of the room. There was about a foot on either side, between the bed and the wall. Not to mention that those logs are heavy. Very, very heavy. I've spent the week worrying about moving it. It was the first thing we planned on putting in the U-haul (which is also pretty gigantic at 26 feet!) and I just wanted it to be done! I'm not really sure why I spent so much time worrying... except that this bed has a way of bumping into things and putting holes through walls when it's being moved... so I guess my fears weren't entirely unfounded. Paul and my dad spent a portion of the afternoon taking it apart and loading it into the truck. Then Sadie came into the room and ran around yelling "Where's the big bed?!?!" and giggling because she knew it was in the truck. When she glanced into the truck her reaction was to giggle and say: "I don't see the big bed!" which is probably because she was expecting it to be fully assembled and to be ready to be jumped on in the truck (Sadie's a big fan of this bed). So the bed and the dining room table and the couch are in the truck along with most of the boxes that I packed. Now to pack more boxes tomorrow and move the lighter furniture. :) That is quite a lovely bed. Kudos to the men for breaking it down and loading it! I hope it's a quick reassembly when the time comes! Best wishes for a continued happy-packing / moving! That bed is simply beautiful! Moving is always a bit of a challenge. I've enough books to fill a uhaul all by itself and years ago when I realized that for me, the books mattered and the couch didn't, I realized that if I kept the focus on what mattered to me it simplified everything. That bed is beautiful though and I bet it is a great spot for the whole family to snuggle for a story!